Caption slip reads: "Photographer: Glickman. Date: 1952-06-04. Assignment: Days of the Verdugo parade, Glendale. 'Here comes the parade'. Kids lined up. 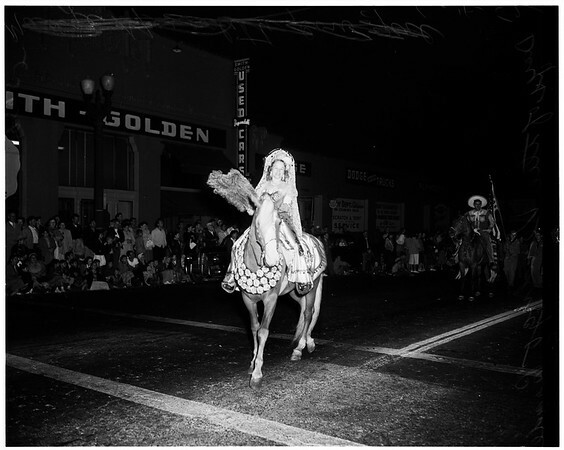 Madge Meredith (cowgirl in slacks) rides in parade. Junior Chamber of Commerce float with queen candidates aboard. Doris Kohler, majorette in black. Opening banner of parade between horses. Lois and Chet Knee in costume on horseback. Majorette Shelia Shoaf jumps. Lions club float. Burbank Fire Department Bagpipers. Johnny Turner, age 2, looks for parade".